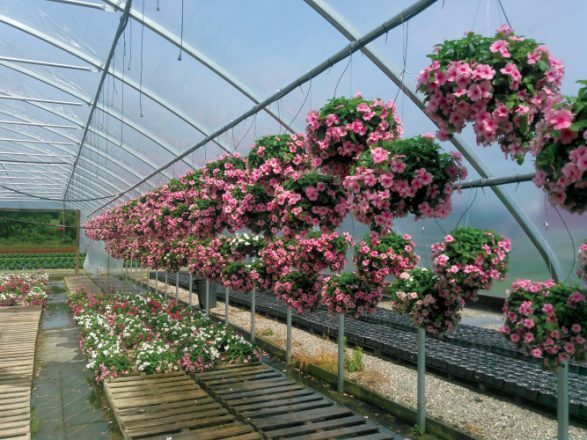 Flower farmer Robert Wimsatt says he grows more hanging baskets of petunias than anyone south of Indianapolis. 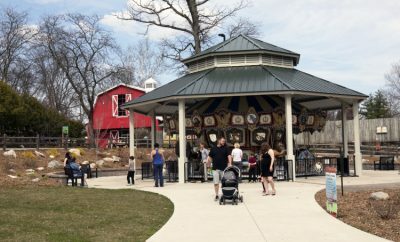 His farm’s 40,000 hanging baskets and patio pots of showy blooms debut in time for Mother’s Day and, ironically, Mother Nature herself plays a significant role in their success. The petunias at HB Farms & Greenhouses in the Floyds Knobs area survive and thrive on the “cold-grow method.” Seedlings start in an unheated greenhouse (yes, no heat) in January and February, when only sunshine and a heavy blanket protect them from Indiana’s most frigid temperatures. 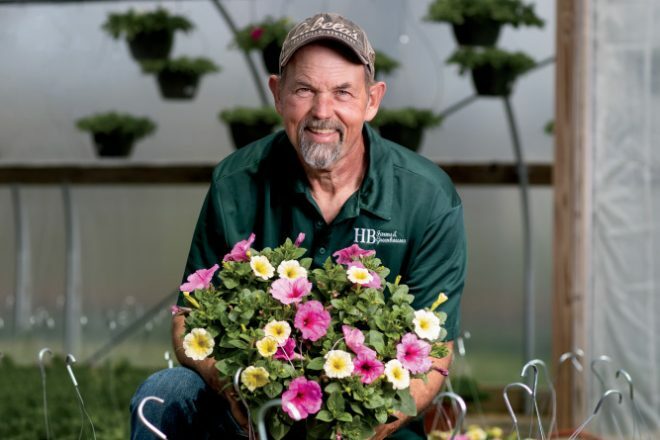 Wimsatt and his team plant the petunias outside in their fields on black mats with irrigation by mid-March, when most competitors keep their petunia inventory heated and indoors. 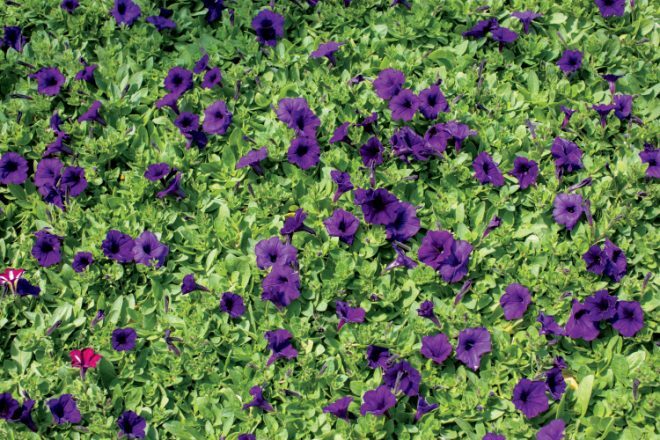 Wimsatt likes the performance of his cold-grown, field-produced petunias. Blooms appear more vibrant, plants are tolerant to frost and thick branches are acclimated to wind, he says. Plus, the farm has no need for growth regulators and saves thousands on heating costs. 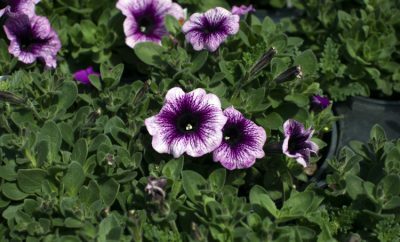 Get petunia pointers from grower, Robert Wimsatt. Wimsatt got into the flower business in 2000 after his family sold its wholesale fruit and vegetable business. His family’s produce customers frequently asked about where to buy mums, so Wimsatt decided to use his horticultural background and existing customer base to dabble in the mum business. Today, HB Farms & Greenhouses has grown to become the state’s largest grower of both petunias and mums south of Indianapolis. 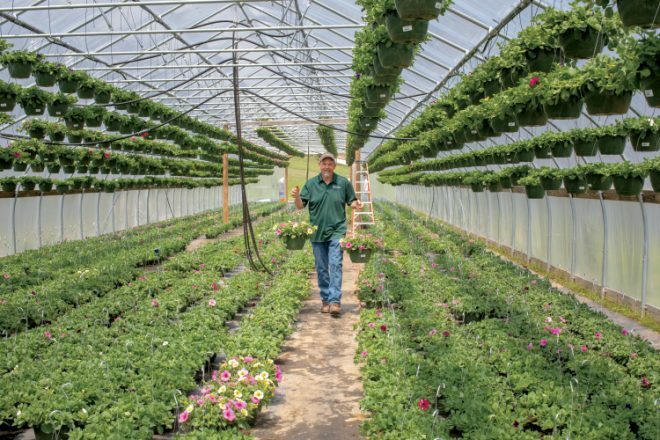 The family farm in Floyd County grows and sells 40,000 containers of petunias, nearly 6,000 perennials, 100,000 hardy mums and a sizable collection of fall-time pansies, ornamental cabbage and kale. The farm sells wholesale to 108 outlets in a 100-mile radius, from independent retailers to popular chains such as JayC. They also offer fundraising opportunities to local groups and schools. 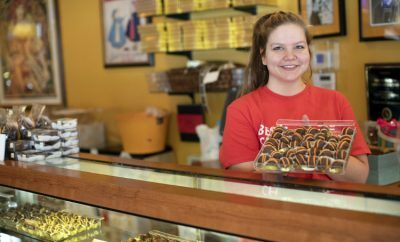 And about 5 percent of their sales are retailed at the “Mum Factory,” their original roadside stop at the corner of Scottsville and Starlight roads in Floyds Knobs. The farm operates more than 43,000 square feet of greenhouse space and about 15 acres of black growing mats with drip irrigation for growing flowers in the field. Those fields draw attention from passersby, who often slow or stop to take in the sight of stripes of vibrant blooms in their peak. Wimsatt and his son Logan grow nine different varieties of petunias and market them in 30 different color combinations. The breathtaking sight gives even Wimsatt a boost at the end of some of the 16-hour work days that thread throughout his farm’s busy seasons from January to October. In 2005, Wimsatt entered the petunia business, but not because he was partial to the popular annual flower. “One of the big reasons I gravitated toward the petunia is because I could cold-grow the petunia,” he says. In basic terms, he starts petunias in a high tunnel greenhouse with a blanket on them. He removes the frost blanket only on days the sun heats the greenhouses. The time-consuming process of removing and replacing the blanket still beats buying heat, he says, but also results in a tougher petunia. He says the flowers freeze at a young age, resulting in a stronger, more vigorous, frost-tolerant plant, often with a higher bloom count. The plants then transition well to the field, even in the frigid – and sometimes snowy – days of March. Contrary to popular belief, this petunia-growing process works. And the proof arrives at local retailers by Mother’s Day. That is, outside of cutting the heating bill. Nursery and greenhouse products are ranked as the No. 6 agricultural commodity in Indiana. 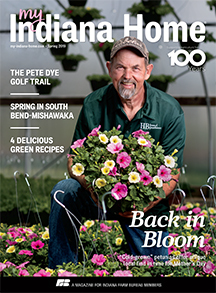 Indiana is ranked fourth in the Midwest in jobs and added value for the nursery industry. The industry provides 39,260 full-time and part-time jobs (31,798 direct jobs and 7,463 indirect/induced jobs). Landscape services, retail and wholesale trade are the top three green industry businesses contributing to the Indiana economy.